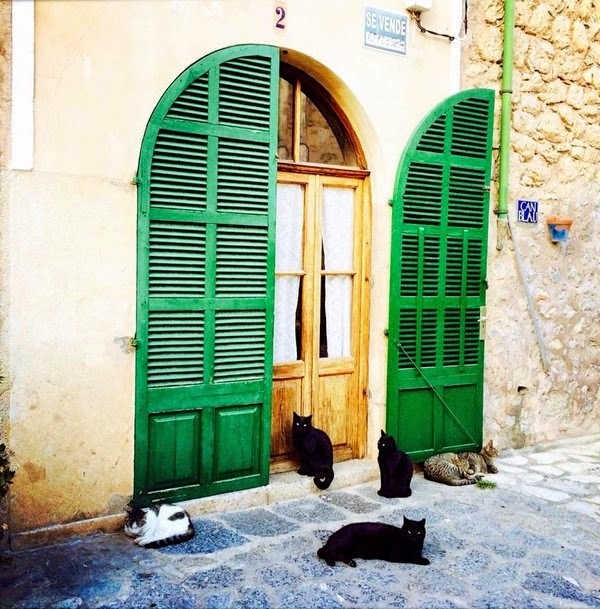 Blogger Claudia Mannes sent in these beautiful pictures of Deià, a foreign artists' colony situated in the Tramuntana mountains of Mallorca. For more info, visit Claudia Mannes' blog. 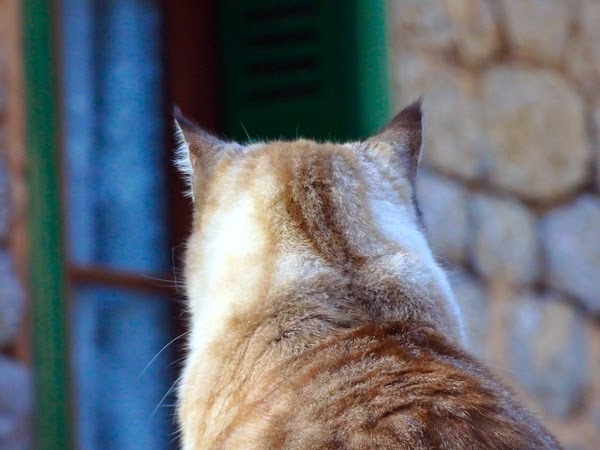 Also check out our story about the cat that became a local celebrity in Gračišće, Croatia. Now that's a nice big bunch of sweeties! 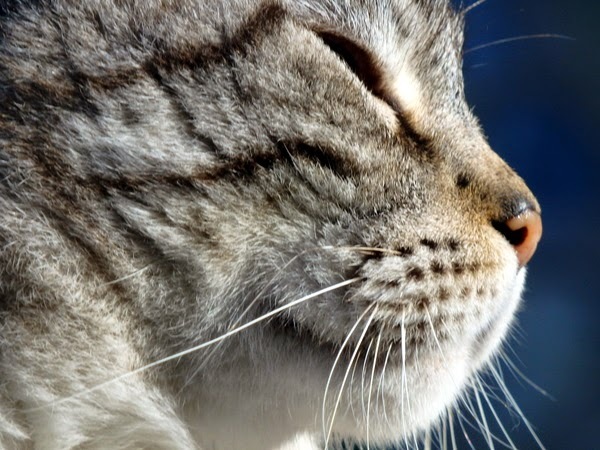 Those are some great pictures and the cats sure look very happy. Such beauties- I wish I could take them all home. 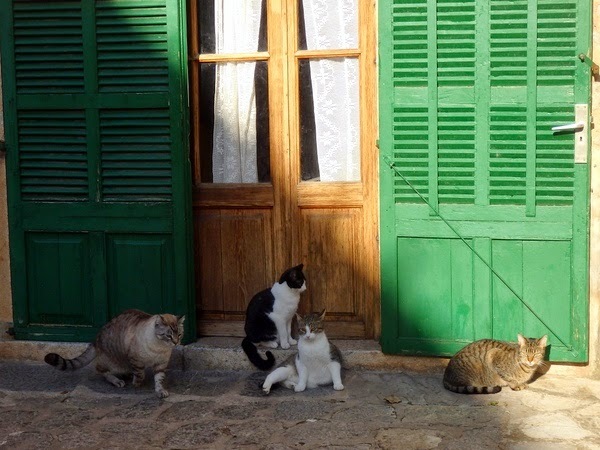 Love the cats and those green shuttered doors! São tão lindos, fazem parte da decoração! They look very sweet. Have a super Saturday. Attractive door and so many cats....the one sitting in the flower pot...that's cute. I wanna hug all of them!!! So pretty. 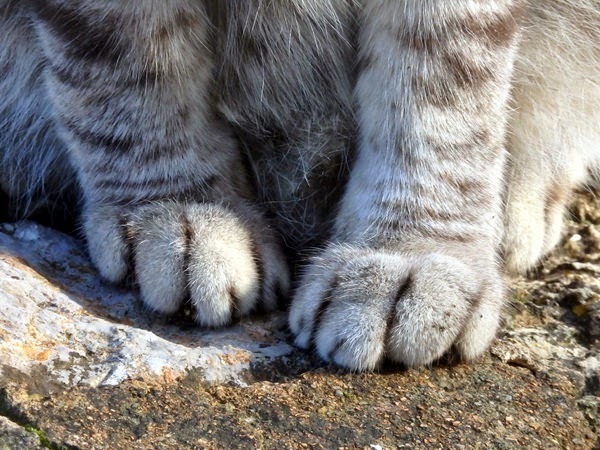 I love the shot of the paws. And so many black kitties. I have a thing for black kitties. 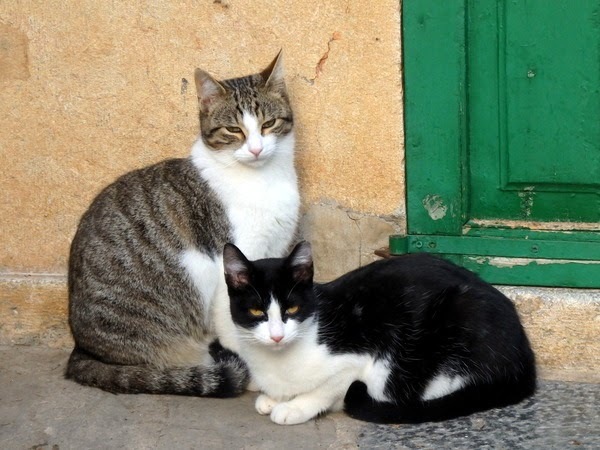 Lovely cats and they look so healthy. Will have to look this place up! There is something mysterious about cats. Especially the black ones. Oh my! They are WONDERFUL! What a beautiful story! The cats are all so precious!!! This is so cool. I would love to visit this place some day. The cats look so content and healthy. 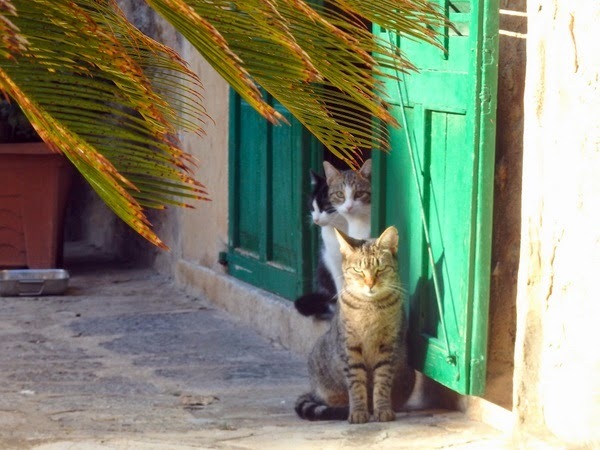 I like Joanna's story, and I LOVE those glorious green shutters, and the arch shape of them. Love the sweet paws picture! What a great life Joanna has lived. The kitties are beautiful and look very sweet! Coucou Vanessa et merci pour ce partage ! We, too, like her story, how fabulous! Gorgeous photos of the cats, those house panthers are stunning. 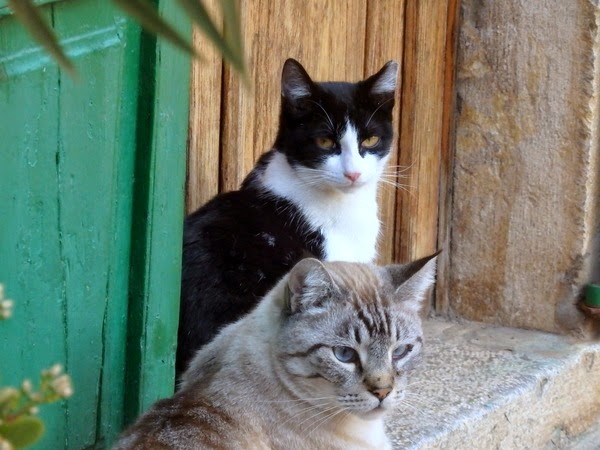 Beautiful colors in the photos and the cats look so happy and healthy......what a great life they have and I think the whole story of how Joanna found her "paradise" is really lovely. what incredibly beautiful photos! 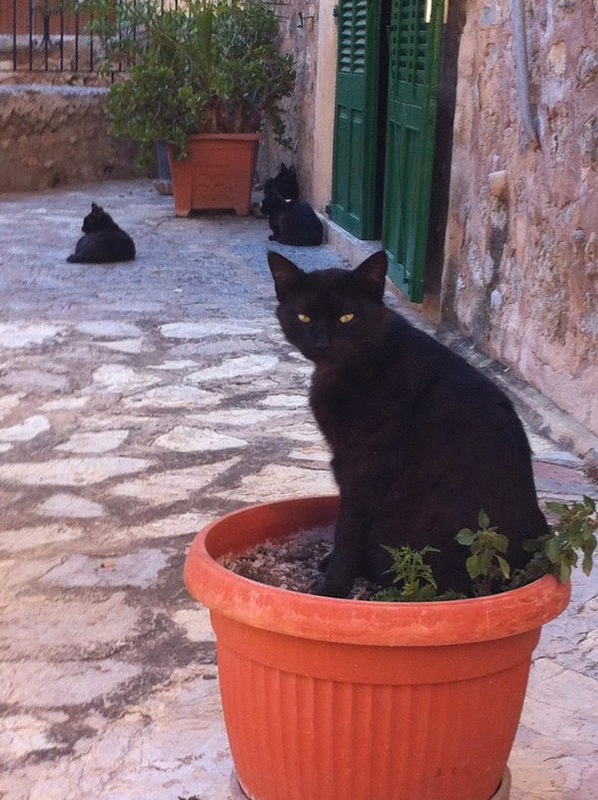 Unusual to see so many black cats in one place. Thank you for introducing us to another blog! Mais quelle jolie promenade. Merci pour ces photos. J'aime tout particulièrement les premières avec les chats noirs. We love these pics! 'Specially the ones with the black cats. What a neat and happy story - love all the cats too! Those black cats are wonderful and makes mum think of Max (long since deceased) he was such a loving boy. Oh what beautiful healthy cats. 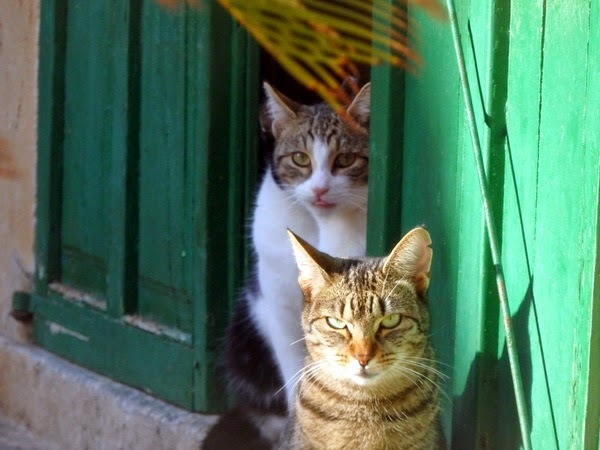 Mom went to Greece in October and she photographed a lot of cats. She said there are so many in the island of Mykonos. Thank you for dropping by our blog. The photos are wonderful! It is always nice to see cats who seems happy and in a good shape. I love it! So beautiful and adorable shots. Thanks for sharing! The black cat with green eyes looks just like our Vasil! He looks that smug, too. They're beautiful. Great captures as always! They remind me of home. We have lots of cats at home. They look as if they were expecting the pictures to be taken, modeling like. Even in Mallorca they find the sun puddles! What lovely pictures of beautiful kitties! Lovely pictures of beautiful kitties! 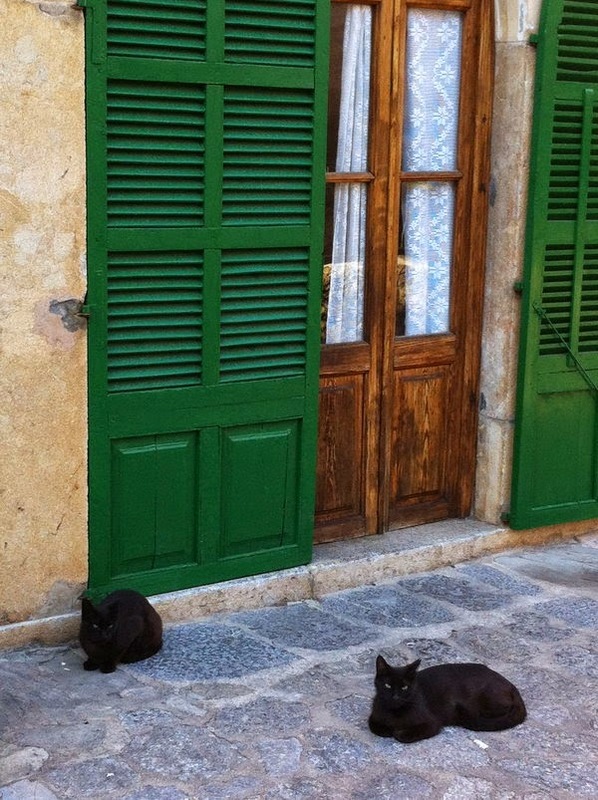 There are some lovely kitties there and the black cats contrast beautifully against the pale stone.